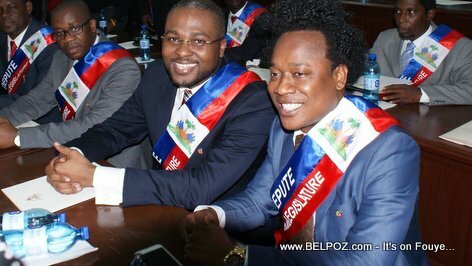 Haiti Politics - What happened to the Majority Depute group APH? Eske APH Kraze? Here is what's making headline news today... Haitian deputes are running around the media to confirm or deny that the majority group Alliance Parlementaire pour Haiti (APH) has been dissolved. Jérémie Depute and APH member Marie Gladice St Jean Lundy admitted her colleagues can not agree on the appointment of Jean Henry Ceant as the next prime minister of Haiti. Anse-à-Foleur Depute Louis Marie Bonhomme, also a member of APH, minimizes the disputes happening within the majority group. Mole Saint Nicolas Depute and APH member Yves Dupras denies statements that a group of 50 deputies is already willing to ratify the policy statement (déclaration de politique générale) of new prime minister Jean Henry Céant. According to Port-de-Paix Depute Jean Marie Florestal, himself a member of APH, this bloc no longer exists. La majorité des parlementaires de la 50eme legislature, pour me pas dire des parlé menteurs, travaillent pour leurs propre interets personnel mais pas en faveur de la population. Most of the problem Haiti have depend of them. Most of them are involved in drug trafficking, most of them were not elected in the last election.